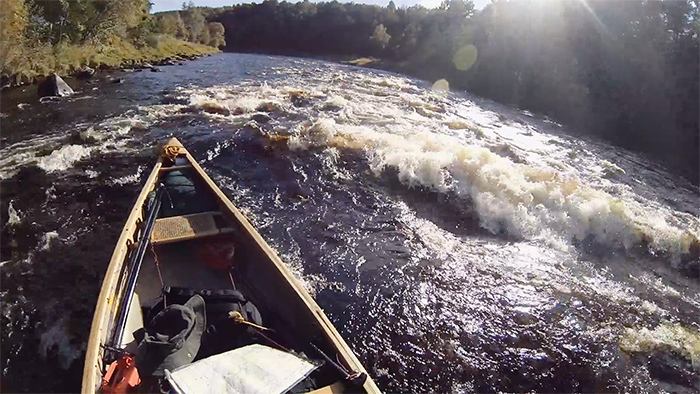 Every year Ray Goodwin and I lead canoe-camping trips on the River Spey in the Scottish Highlands. It’s a lovely river to paddle in an open boat and the surrounding scenery is beautiful. Travelling in such a fantastic natural environment, there are many highlights. Amongst the highlights of a watery nature are several rapids which we paddle on the Thursday of our trips, one at Blacksboat, very popularly referred to as The Washing Machine and Knockando, one of the steepest parts of the whole river. This paddling day also includes the confluence of the River Avon with the River Spey. The above is usually paddled by lunchtime, then there is plenty to entertain and entrall during the afternoon. It’s always a great day on a great trip. On one of our 2015 trips, this day became known as “wash day” by members of our group. The video below is a video blog of that day. It was a pleasure to journey with you, Ray and the others! Looks like serious amounts of fun was had. Maybe one day I’ll come paddling. I need to get the fundamentals of the outdoors down before I move on up to the advanced stuff. It would be interesting to see what it would be like on a rainy day. Great video!was it human error or just bad luck that made the canoe tip? Excellent . I want to go again! Looks like great water and weather. That was one great video. It almost makes the viewer feel they are aboard the canoe trip in person. A great vid Paul. Gives a real flavour of the trip. Makes me want to finish making my canoe and get it on the water! Hope to see you next year at some point.